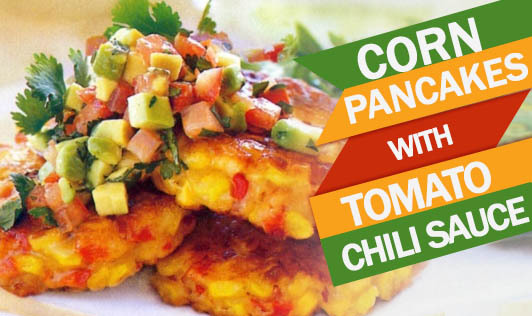 • Blend tomatoes, green chili and sugar together in a blender and transfer to a bowl. • Add the chopped onions, coriander, lemon juice, black pepper powder, and salt. • Mix and refrigerate for 1 to 2 hours. • Blend the corn in a grinder to make a soft paste. Keep aside in a bowl. • Add 1 ½ cup of besan, chopped onion, ginger-garlic-chili paste, cumin powder, turmeric, coriander, and salt to the corn paste. • Mix using enough water to make a thick batter. • Heat oil on a nonstick pan; add a small amount of batter, spread into a pancake, and cook on low to medium flame until it turns golden brown on both sides. • Serve hot along with the tomato chili sauce.